Are you ready for an amazing salad? Like blow your socks off salad. 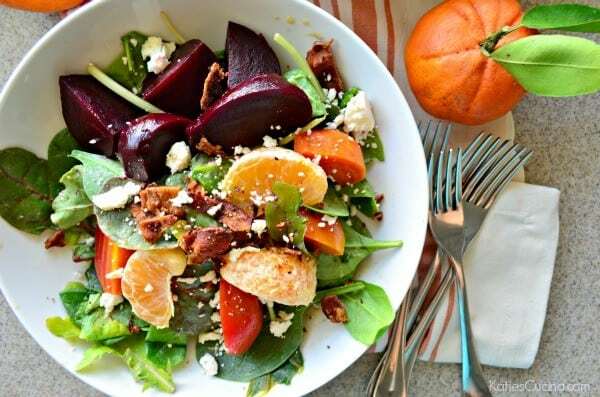 Because this salad recipe for Beet, Bacon, and Citrus Salad with Garlic-Citrus Vinaigrette pretty much takes the cake of all time amazing salads. I vowed to my readers that I would share one new smoothie and salad recipe each month for the entire year of 2016. And boy can I just say I’m excited to share this salad recipe today. I’m not sure how I’m going to top my future salads. This salad is the best mix of sweet and savory. 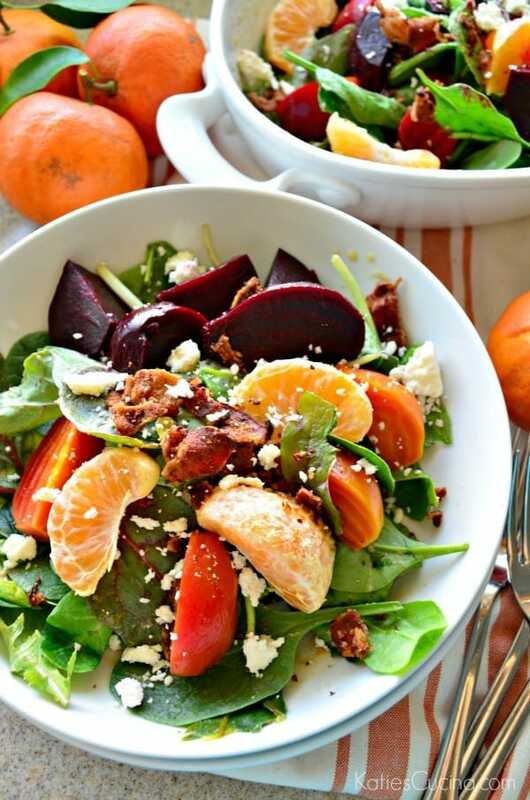 Savory with the garlic, bacon, and feta and sweet with the tangerines and roasted beets. I love beets, and sadly I grew up eating them canned and pickled. I didn’t consume a true fresh roasted beet until I was in my 20’s and then when I finally tried it I wasn’t a big fan. I’ve learned to pair it with sweet and savory ingredients and now I love them. Sadly, my husband does not love beets, and I really wish he did. I keep making him try beets in hopes one day he will love them. He did try this salad in hopes he would have a change of heart. Sadly, he still hated them. But gladly ate up all the tangerines in the salad. I first saw this recipe idea in this months edition of Cooking Light. I flagged the recipe as one I might try but didn’t think I would. Then I was shopping at Fresh Market last week and saw gorgeous fresh organic red and golden beets. I snatched them up and on my drive home I decided I would make a beet salad for lunch. I made a much larger salad than what the original recipe called for. And I added a few items that weren’t in the original recipe plus doubled the vinaigrette and added feta cheese. I just felt the salad was not complete without cheese, so I added just one tablespoon of feta cheese. Just a little bit of feta gives you that creamy cheesy flavor I crave. Seriously, this Beet, Bacon, and Citrus Salad with Garlic-Citrus Vinaigrette made me feel like I was eating at a high-end farm to table restaurant. It’s exactly like something I would order out. And now I can make it at home. I can’t wait to have my mom over so we can share this salad together. I know she will love it since she is a beet lover! 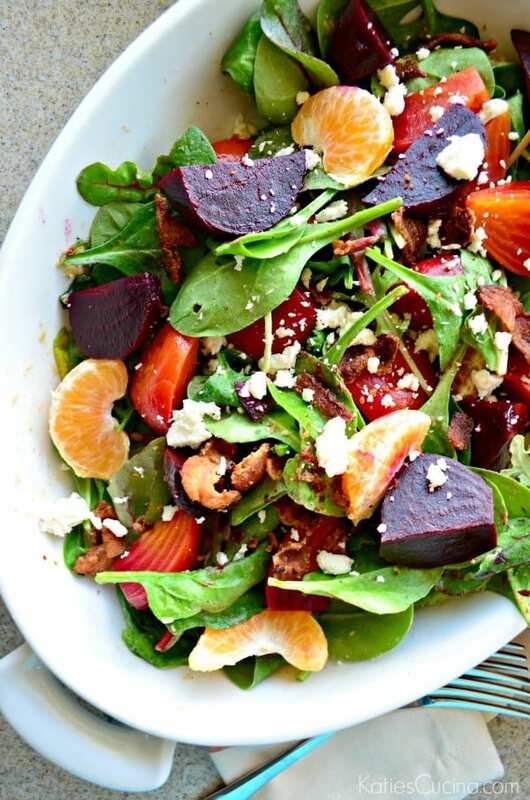 How do you make Beet, Bacon, and Citrus Salad? I used a blend of Earthbound Farms Organic Deep Greens Blend it’s a mix of tender baby spinach, baby red and green chards, and baby kale. I also found this on my trip to Fresh Market, and was super excited because I’ve never seen this mix in my local grocery store. I’ll definitely pick this blend up again on my next trip to Fresh Market. I also added a container of organic spinach, and tossed it together and made for the perfect leafy green mix. Plus the two mixes are great greens to wilt. Tot make this salad, you’ll start by preheating your oven and then chopping the beet greens off the beets. Wash the beets good and then wrap tightly with foil (divide the beets into two pieces of aluminum foil: golden and red). Place all the aluminum foil bundles on a baking sheet and bake for 1 hour. Once the beets are cooked let it cool and then rinse the beets under cool water and peel the beets. The skin will easily come off. While the beets cool cook the bacon on medium heat for 5 minutes or until golden brown and crispy. ((Next, make the dressing–see details below)). Remove the bacon from the pan and place on a paper towel. Remove the pan from the heat and pour in the orange juice garlic mixture. Mix well with a wooden spoon. Place the greens and spinach in a large bowl. Pour the garlic dressing on top of the greens. 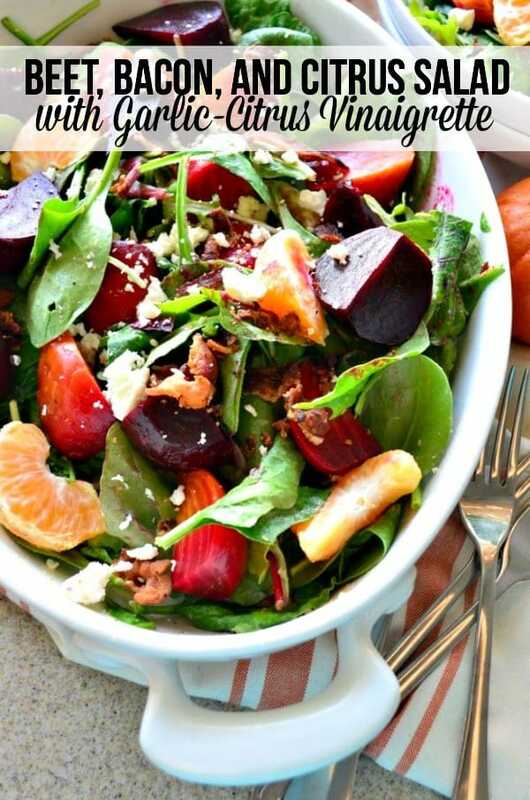 Toss well then quarter beets, peel the tangerine and cut into segments, chop the bacon and add to the salad. Crumbled feta on top and divide among plates. Enjoy immediately. How do you make Garlic-Citrus Vinaigrette? You’ll wilt the greens with the savory yet sweet warm garlic-citrus vinaigrette you’ll make for this salad. You will use an entire bulb of garlic for this dressing. I know it sounds like garlic overload; however, I promise you once it’s roasted it’s sweet and not as pungent. First, you’ll remove the papery skin from the garlic head (but don’t peel or separate the cloves). Cut off the pointed end of the garlic head. Wrap tightly in a piece of aluminum foil. This needs to bake for one hour. Once the garlic is done, using a small bowl mix together the water, orange juice, red wine vinegar, salt, and pepper. Mix the vinaigrette well and then squeeze in the roasted garlic. Mix again and set to the side. Next, remove the bacon from the pan and place on a paper towel. Remove the pan from the heat and pour in the orange juice garlic mixture. Mix well with a wooden spoon. That’s when you add in the greens to just slightly wilt! My husband picked tangerines from his parents tree the other day, so I had an excess of tangerines and since they are in season I felt they were a perfect addition to this salad.I normally can not eat citrus because I’m allergic to it; however, I ate a few tangerine segments with the salad and it was so delicious. It compliments the salad so perfectly. And good news, I barely had an allergic reaction. 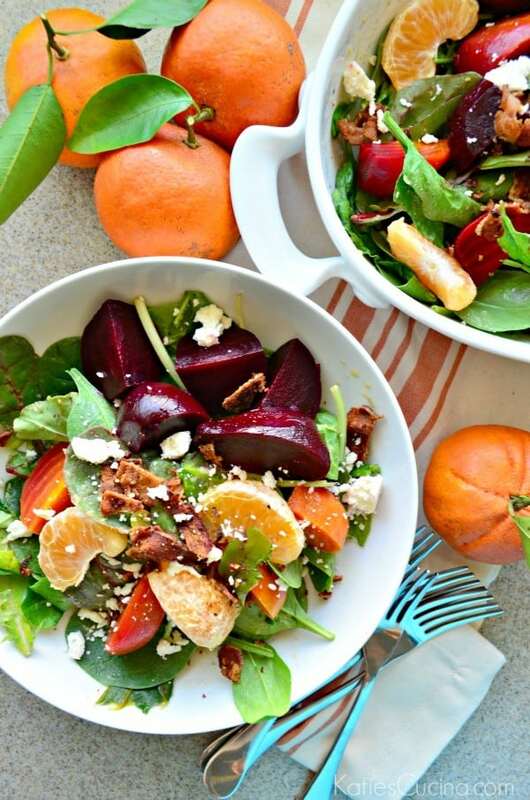 If your looking for a light yet hearty lunch or a gorgeous salad to serve with dinner this recipe for Beet, Bacon, and Citrus Salad with Garlic-Citrus Vinaigrette is the recipe for you. Remove the papery skin from the garlic head (but don't peel or separate the cloves). Cut off the pointed end of the garlic head. Wrap tightly in a piece of aluminum foil. Chop the beet greens off the beets. Wash very good and then wrap tightly with foil (divide the beets into two pieces of aluminum foil: golden and red). Place all the aluminum foil bundles on a baking sheet and bake for 1 hour. While the beets cool cook the bacon on medium heat for 5 minutes or until golden brown and crispy. In a small bowl mix together the water, orange juice, red wine vinegar, salt, and pepper. Mix then squeeze in the roasted garlic. Mix well and set to the side. Remove the bacon from the pan and place on a paper towel. Remove the pan from the heat and pour in the orange juice garlic mixture. Mix well with a wooden spoon. *I roasted the beets and garlic one day and then made the salad the following day. If you choose to do this you can just keep the garlic wrapped in aluminum foil and squeeze out once your ready to use it. Make sure you peel the beets once they are cooked and cooled. Then store in a plastic bag until your ready to consume. By doing this 2 day process it makes putting this salad together so easy to put together! Inspired by Cooking Light, January/February 2016. Any excuse to eat beets is A-OK with me! This is one gorgeous salad!